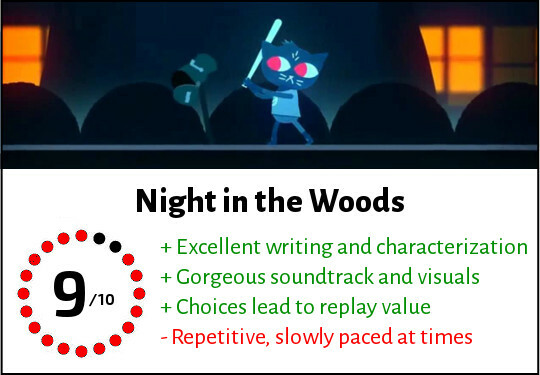 There was a fair amount of hype and anticipation surrounding the release of Night in the Woods. Originally pitched by studio Infinite Fall on Kickstarter in late 2013, it reached its initial goal of $50,000 in a mere 26 hours. It would go on to earn over $200,000 within the span of a month. These kinds of success stories are what crowdfunding is all about. Nearly three and a half years later, Night in the Woods was finally released, much to the excitement of its over 7,000 backers and those who got wind of it somewhere along the way. From where I’m standing, with tears in my eyes and its beautiful soundtrack echoing in my heart, what was accomplished with Night in the Woods is nothing short of astounding. A true success story from start to finish. Though the title might get drowned out by some of the bigger, more “impressive” titles being released this year, I’m here to tell y’all not to overlook it, because I’ll be hard-pressed to find a game that hits as hard in the feels as Night in the Woods. You play as Mae Borowski, an anthropomorphized cat who has unexpectedly dropped out of college and returned to her hometown, Possum Springs. She arrives to exactly zero fanfare: her parents forget to pick her up at the station, leaving her to make the somewhat dangerous trek home on her own. When she gets settled, she spends the next few weeks struggling to reconnect with old high school friends–some who have changed, some who haven’t changed at all–and interacting with various acquaintances and strangers around town. She notices how much the town itself has changed since the last time she was there, too. Many mom and pop businesses that had been around for years have now closed their doors. An old mining town back in the day, Possum Springs now has very little to offer in a modern economy. Jobs are scarce, money is tight. The future of the town is looking bleak. Welcome home, kiddo. Oh, and Mae also finds a severed arm lying on the ground. Awkward. Night in the Woods excels in its writing and characterization. This is not a plot-driven game. If that’s your jam and jelly, I don’t recommend it to you. There certainly is a plot, but it takes the backseat to character up until the last act, and even then, the plot only works because of the emotional connection you’ve developed with the characters over the course of the game. The pacing is intentionally glacial. As Mae, you go about daily activities very deliberately. You are tasked with exploring every inch of the town, talking to every townscreature you can, stargazing, standing around in parking lots, painfully trying to relate to teenagers, etc. And then you rinse and repeat the next day. And the next. You get the idea. The truth is that not a lot happens in Night in the Woods. Except there’s a ton happening–you just can’t really see it unless you’re paying attention. The heart and soul of the game is Mae’s interactions with her old high school friends. Her best friend, a fox named Gregg, is the only character truly thrilled to see Mae again. They quickly resume their friendship and immediately conspire to engage in petty crimes around the town. We meet Gregg’s boyfriend (and bear–like, an actual bear) named Angus, who is friendly, dapper, and warm, but fairly indifferent to Mae’s return. And then there’s Beatrice (Bea), a goth-looking alligator who comes across as annoyed or even downright aggressive towards Mae. As you play, you uncover the backstories and histories between them and Mae. The true challenge of the game is in deciding who you are going to spend time with on any given day. These daily decisions will absolutely impact how the story unfolds, even if the end-game is from what I understand still essentially the same. I was playing the game alongside someone whose game looked almost completely different in terms of the side quests/activities, and how the story is delivered. For this reason, the game pretty much demands multiple play-throughs. That all sounds well and dandy, right? I mean, for all intents and purposes, yes. But I’ve been keeping something from you this whole time. Did I mention that this game is also about mental illness? And trauma? And abuse? And queerness? And faith? And the agonizing death of the small American town? Because it is. All of these things are bravely explored and executed almost too realistically. As someone who is very sensitive to pretty much all of the topics this game deals with, I struggled through some scenes. The writing is unflinchingly brutal in places, especially pertaining to Mae as you start to uncover the mystery of why she suddenly left college. Some of the scenes feel like a punch to the gut. As a somewhat aimless millennial with issues similar to those that plague our protagonist, I found myself relating to her in ways that made me uncomfortable. It’s easy to point out Mae’s flaws objectively as you play through one cringe-worthy scene after another, but it’s tougher when you find yourself empathizing with her a little too often. It really started to mess with me after a while, and I would have to put it down for a bit before picking it back up again with a clearer head. All that said, I’m so glad this game exists for those very reasons. Who knew that an adorable game about anthropomorphized creatures could carry such an emotional punch? Or that it could afford me the much needed mental and emotional introspection that I’ve apparently been craving in my video gaming? This is what takes this game from being good to truly spectacular. I found myself in tears on multiple occasions over the twelve hours it took to complete this game. I thought about it well after the final scene faded to black. I got lost in the beautiful OST (which is apparently three volumes long and can be listened to/purchased here). Across the board, this game is a standout. Bravo. Glad to hear it! I’ll do anything I can to promote this beautiful game. ^_^ If you do play it, I’d love it if you could hop back on here afterwards and let me know what you thought of it. That said, do you share your writing on any other sites? I work over at Creators .Co (we’re part of Now Loading and Playsource) and this is the sort of content that makes for an interesting read. Would you be open to the idea of crossposting your work on our Creators fansite or sharing you wordpress posts with the users in our Facebook group? My e-mail and more info can be found on my page if you’ve got any questions. This sounds like my type of game, definitely going to check it out! Wow, I now regret not buying this when spotting it on PSN the other day. Being unable to reconnect with high school friends after going away to study is something I can relate to. It’s not too late to buy it! I will admit that $20 is a little steep, but with the replayability value and different activities/quests you can get depending on your decisions, I think it’s well worth it. Night in the Woods is a rare gem in its realistic portrayal of that strange dynamic of high school friends trying to reconnect, but who ultimately have little to nothing in common except the fact that they grew up in the same town and went to high school together. It’s pretty telling that a couple of days after I finished the game, I had a dream about some people I knew in high school that I hadn’t thought about in years. I ended up looking them up on Facebook when I woke up, and it was super weird how unrecognizable they were based on how I remembered them. NitW isn’t quite on that level since the protagonist is only a few years out of high school, but the idea still resonated with me very much. Great article! I’ve heard incredible things about this game, and I’m looking forward to actually trying it out myself! Just wanted to let you know that I’ve nominated you for the Mystery Bloggers Award! I really liked your post, and I hope more people will check out your blog! Pingback: Mystery Blogger Award: Acceptance Speech!